and then drove to the depot to meet the folks. Father was thee with the other buggy. Ott & Fanny did not come. After supper Will and I took Charlie back home and left him and walked back, stopping in town to head the band play. Sunday July 9th 1893 I was busy about the house most of the forenoon as it was very late when we got up. We went over to Woolfs in the afternoon and stopped at home awhile. They are going to have a new hired man in the morning. We went to church in the evening and Ott & Fanny came on the ten oclock train. 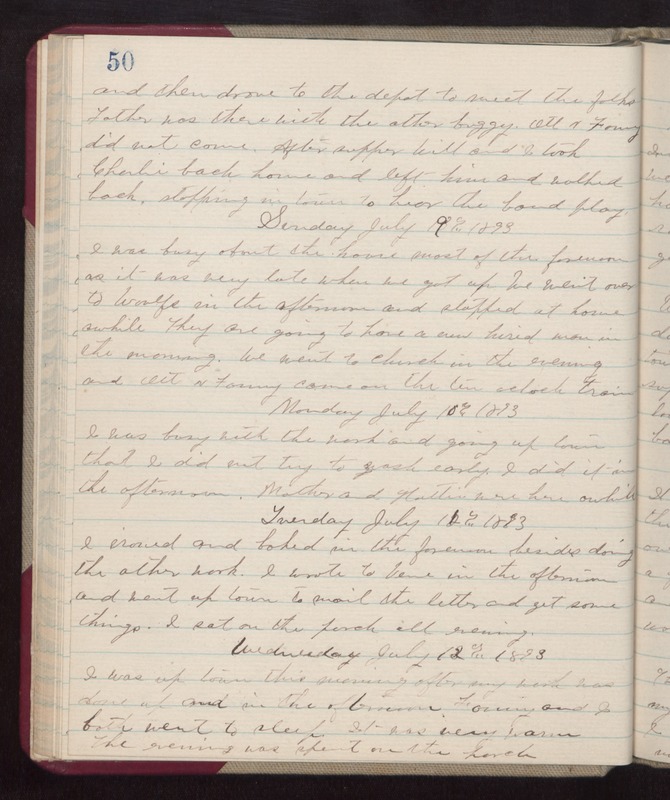 Monday July 10th 1893 I was busy with the work and going up town that I did not try to wash early. I did it is the afternoon. Mother and Hattie were here awhile. Tuesday July 11th 1893 I ironed and baked in the forenoon besides doing the other work. I wrote to Vene in the afternoon and went up town to mail the letter and get some things. I sat on the porch all evening. Wednesday July 12th 1893 I was up town this morning after my work was done up and in the afternoon Fanny and I both went to sleep. It was very warm. The evening was spent on the porch.